Is there actually someone who doubts the quality of any Under Armour product? An established name is all clothing and sports apparel recently became even more popular amongst the customers. They caught our attention with 495 Indoor/Outdoor Basketball. This model is reasonably priced and we wanted to see if the quality accurately depicts the price tag. Before we started our test, we scouted all the review sites in order to see what other people are saying about this particular model. We usually do that after our initial test, but this time, we opted to take notes from other users and test their findings in our tests. Basically, the idea behind it is to put the 4.3-star user rating to the true test. 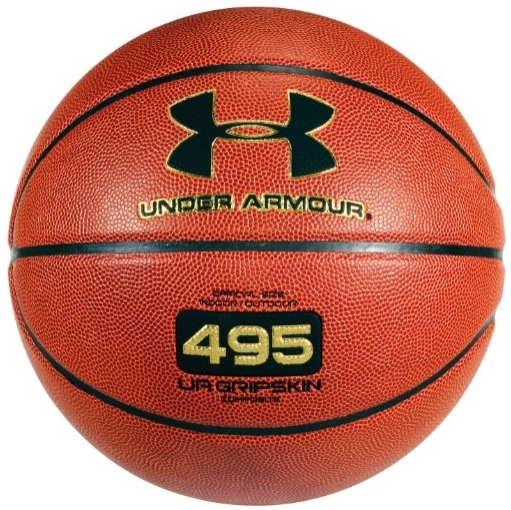 Line any Under Armour product, 495 is simply a top quality basketball and that can be noticed even by simply looking at it. As soon as you pick it up, the UA GRIPSKIN surface captures your attention. It feels amazing and you get the sense that there is plenty of grip and control. Of course, that proved to be true once we started playing with it. Another thing we noticed is that the valve is really well hidden, but still quite accessible. This is important because switching surfaces often requires different air pressures. The UA GRIPSKING simply feels natural and ball control is amazing. The extremely dense pebble pattern will make sure that you always have the optimum contact surface to the skin, even when the ball is dirty. Pebbles are a bit deeper which contributes to the durability. Rough surfaces tend to wear out those pebbles fast. The channels on the ball are wider than we expected and they are slightly slanted. That means no matter how you palm the ball, your fingers will always find enough channels to quickly change the tempo. We tested a size 7 with official weight, but somehow this ball felt a bit heavier than usual. That contributes a lot in short and mid range shots, as you have better in-flight stability with low or no spin shots. And for the long range shots, the rotation is perfect and you have a complete control over the release of the ball. The design of the 495 features a Nylon Windings that make sure the ball retains shape regardless of the stress. Overall, this is an extremely reliable ball that will always behave the same way, whether played in or outdoors. Under Armour 495 is a quality product and an affordable alternative to buying 2 separate balls. As long as you keep it clean, you won’t find any issues with it and it will serve you well for a couple of seasons so it’s a good choice for a reasonable price.